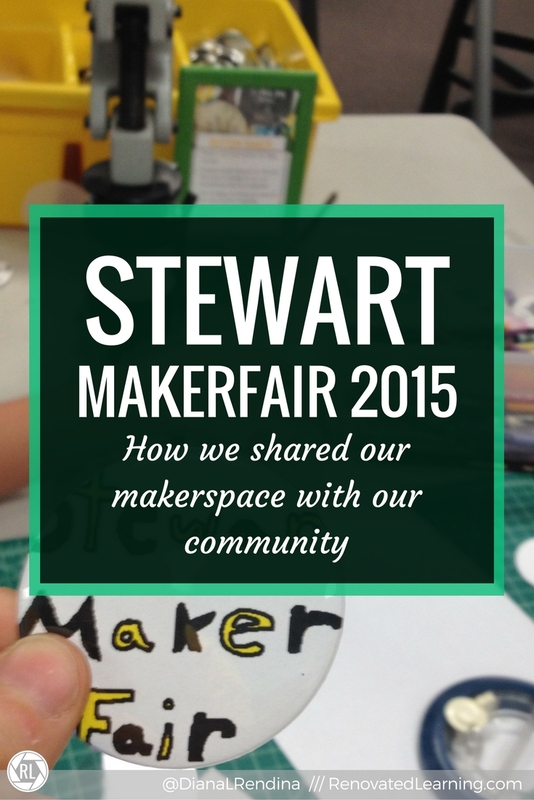 In April, we held our second annual Stewart MakerFair during our final parent conference night of the year. Last year’s Mini Makerfaire was focused more on introducing our community to what we had started with our Makerspace program. This year, our program was already well-established, so we created a fun event focused on STEAM exploration in a variety of no, low and high tech stations. We set up stations throughout our media center where students, parents and community members could try their hands at a variety of maker activities. We wanted to have a nice mix of both interactive stations and make-and-take activities where our guests could create something to take home with them. I recruited students from my after-school STEAM club and Media Advisory Board to help run all the stations. 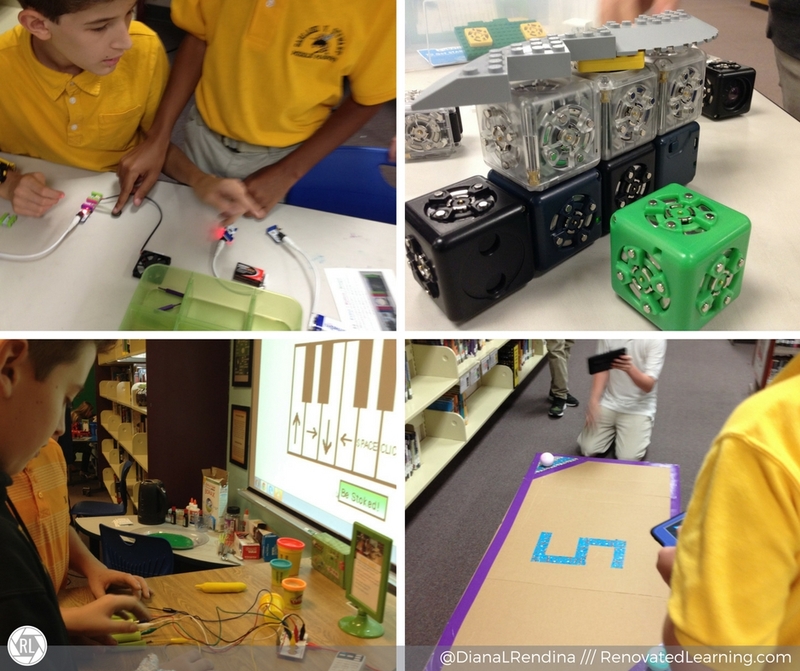 For our interactive activities we had: a MaKeyMaKey celery piano, a littleBits table with task cards to guide our guests, a Cubelets table and Sphero battles and races (check out the video!). For our make-and-takes, we had: Perler bead art, potholder loom weaving and our awesome, old-school button maker. We invited members of our local maker community to visit and share some of what they’re working on. Tampa Hackerspace brought one of their 3D printers. 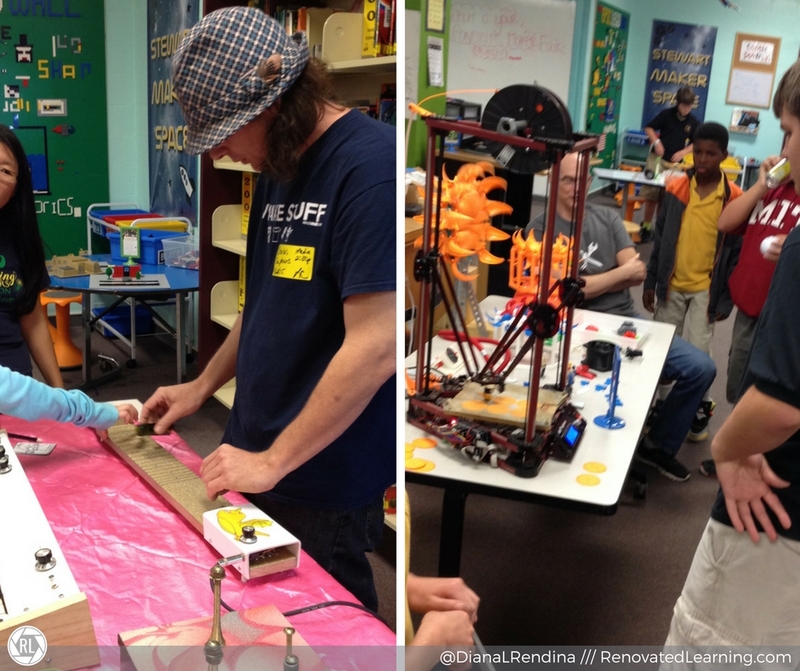 They shared with our guests throughout the night about the resources they offer and explained how 3D printing works. We don’t actually have our own 3D printer in our makerspace (yet), so this was a great way to let our community learn about this important aspect of the Maker Movement. We also had Chuck Stephens, who brought his amazing recycled musical instruments. Our students and guests had a lot of fun trying out the instruments. I heard the Super Mario Bros theme song on the Arduino-programmed synthesizer more than once. Throughout the night, we held several demonstrations of maker activities. 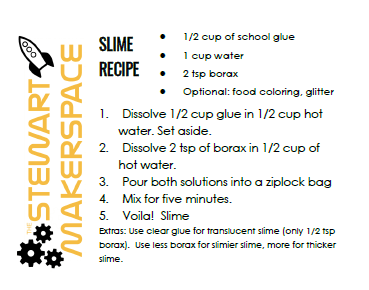 I showed our guests how they can easily make their own DIY slime at home out of glue, water and borax. We also gave our recipe cards for them to take home. This one was a popular demonstration last year, and guests really liked it. Check out the video to see it. My students built a K’nex roller coaster (made from instructions, but that doesn’t make it less awesome) that was running throughout the night. Guests would constantly stop to watch it and snap pictures and videos with their phones. A couple of my students in the after school group have been working tirelessly on what they call “The Shatterer”. 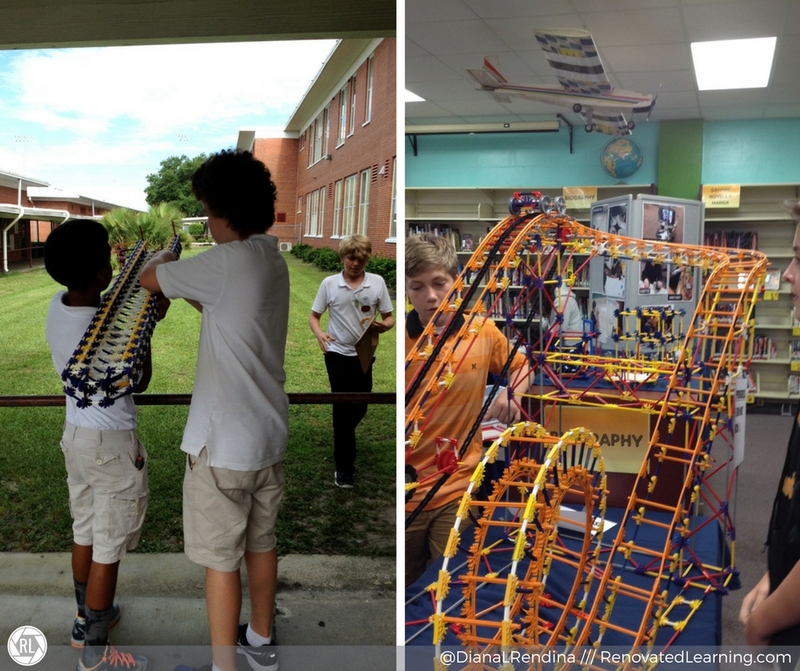 This is a K’nex rail cannon that uses rubber bands to launch K’nex arrows. After an unfortunate incident involving a cracked television screen, we decided to hold this one outside. They demonstrated several launches, and answered questions about how they designed it. So phenomenal! You and your students should be over the moon pleased with what you’ve done! 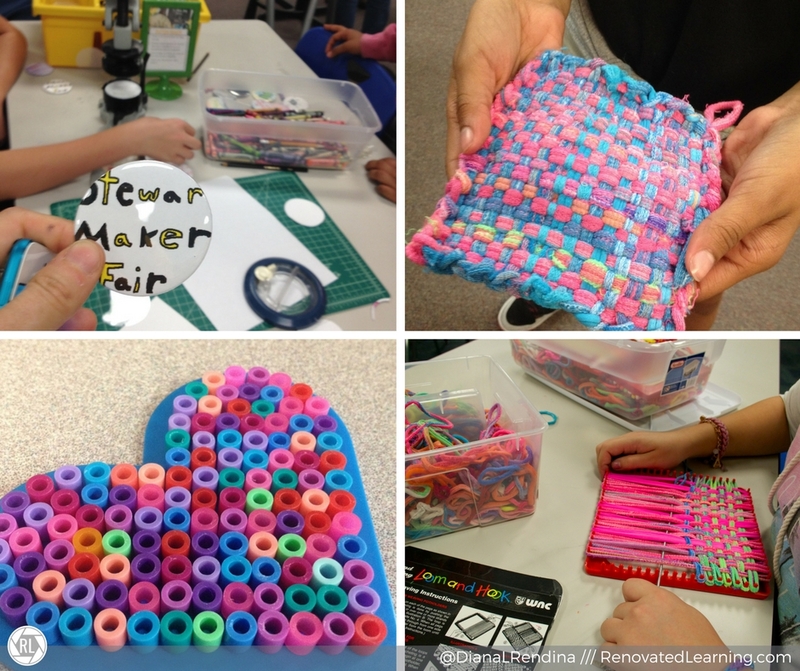 I am sharing your work as an outstanding example of what ‘can’ be in maker education. Congratulations! Thanks for updating us all on your Makerspace genius! You and your students are inspiring me and my students all the way up here in NH!!! You rock!